Some form of wood-carving has been practiced in nearly every civilization and culture, from the time of ancient Egypt to the present day. Carved wooden altars and statues have adorned places of worship, from Christian Europe to the Buddhist Temples of the Far East. Native Americans whittled ornate pipe stems, and Australian Aboriginals carved everything from boomerangs to didgeridoos. The carved wooden sign, however traces its roots to the age of sailing ships. Just as important as the sculpted figurine projecting from the ship’s prow, was the ‘quarterboard’ bearing the name of the vessel. Although it was considered bad luck to have a woman on board ship, clippers often bore a female name, and were always referred to as ‘she’. In this age before radio and GPS navigation systems, shipwrecks were so common off the coast of New England, that a law was passed requiring that every ship quarterboard have the name carved into it. That way, the ship could be identified when the wreckage (including the quarterboard) washed ashore. From these grim beginnings, the great industry of the carved sign was born. Little did it matter when ships became metal and steam-powered, and later diesel. Nor did it stop the craftsmen when the quarterboard law passed into oblivion. Carved wooden signs were now a feature of the storefront or home, rather than a ship’s bow. They could be found in inland towns where the folk had never seen a gull or heard the roar of the surf. The carved sign was here to stay. Some of the best timbers for sign carving are the giant softwood trees of North America’s West Coast such as Old Growth Redwood and Western Red Cedar, or imported woods like Brazilian Mahogany. The giants, with their massive trunks, could be quarter-sawn to provide broad 'clear heart' planks with vertical grain and few, if any, knotholes. In the last few decades, however, these stands of ancient forest have become protected, and rightly so. I would rather leave the last of these giants standing for future generations, than have them felled to make a few more carved signs, however well-designed and crafted they may be. The ever-growing demand for carved dimensional wooden signs, coupled with a decreasing supply of quality carving timber, has spawned an industry producing wood-substitutes specifically for sign-making. Danthonia handcrafts our 'wood' signs from SignFoam3 HDU - a closed cell substrate with recycled content. SignFoam was the first faux-wood material developed for sign-making, and in the opinion of many signmakers it remains the best. At our workshop, we use an 18lb density and laminate to a firm PVC backing or core for added rigidity and superior hardware hold. 'High Density Urethane' is waterproof, insect-proof and fire retardant. It carves, paints, and machines like redwood - but without grain or splinters. Our standard product looks and feels just like a painted wood sign - especially if you choose the 'brush texture' for your design. For an additional 'custom artwork' fee our artists can create a faux wood grain. Your sign will look like clear coated wood. Weathering is superior to wood in exterior applications as it will not crack, split, swell or rot in the elements. Sign thicknesses average about 1.0 to 1.5 inches. All carving and art is done by hand. Danthonia uses Dulux Weathershield paints. The manufacturer advertises a 15 year guarantee against cracking, blistering or peeling. These UV resistant paints use mineral pigments so most colors will show no significant fading for 8-10 years. Look at our design gallery, find a classic wooden sign design and then customize it - even a novice designer can produce professional looking personalized 'wood sign' designs. Whether you need a handcrafted House Sign, Farm Sign, or Business Sign these tools make it easy. 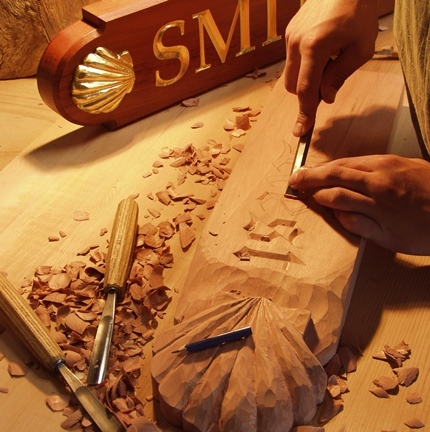 Capture the style of a master wood carver on your next design and let Danthonia do the rest. Wooden outdoor signs tend to split, rot, or warp over time. Cracks in paint break the moisture seal and accelerate deterioration. 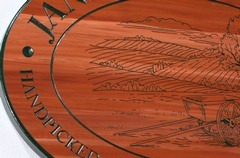 A wood sign requires frequent maintenance to protect it. Most sign owners today do not have the time, tools or skill to keep a wooden sign looking good. That is why Danthonia prefers to craft signs using High Density Urethane which is more durable than wood. 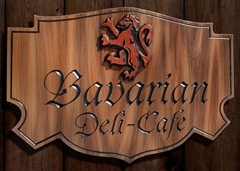 HDU is both weather-resistant and insect-proof so our hand carved exterior signs look great for many years to come. HDU has the same density as redwood with comparable dent resistance. A Danthonia sign looks and feels just like a painted wood sign. Our 'brush texture' painting option offers distinct horizontal brush strokes - identical to the look of paint applied over wood grain. Chisel and wire brush can be used to create driftwood patterns or other custom wood sign effects as required.